Hey guys, I'm a freshman in College and I've never had a job before. I really want to get a job doing some web development at my campus. The jobs are all entry level and I've beeing developing websites for the past six years so I feel like I should be able to land a job, but I want to make sure my resumé looks good. If you guys could critique it that would be awesome! Familiarity with blogs and other Web-related social networking tools such as Facebook, Twitter, Pinterest, and LinkedIn. I had an older member of my fraternity help me with the resumé but I feel like there is way to much fluff in there (such as the 125 words per minute :/). Please don't hold back, tell me anything and everything that is wrong about it. P.S. I apologize if this is not the correct place for this. 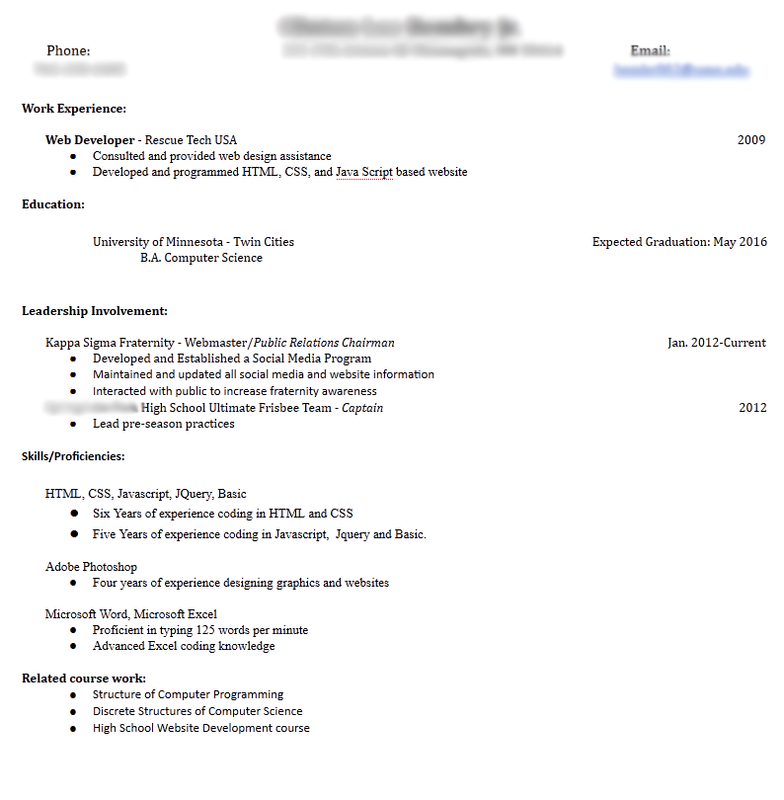 EDIT1: Forgot to add to the resumé that I have experience in PHP. I personally don't see anything wrong with what you have there. It's difficult for students with relatively little commercial experience to demonstrate their applicable skills, so I wouldn't worry about having typing and such things just now - in 5 or 10 years when you have a few more jobs to list I would expect to see more technical skills and things like typing to be generally implied. Just be ready to discuss and answer questions about anything included on your resume, for instance how various skills may aid you in fullfilling the requirements of the role. I don't see any server side or database experience listed, given that the job description would seem to be working within a PHP based CMS I would assume they will look for these skills - if you have done any related course work I recommend including it. Also, if you have done any group project work briefly mention your involvement and the outcomes. Looks pretty good to me. I'm sure you know that you need to somehow make it easy for them to get access to the websites you did, because that's really the main thing they will want to see. The typing comment does sound a bit weird, especially in the MS-Word section. Unless you're a secretary taking dictations in the 70s, or a court stenographer, the typing speed is largely irrelevant, purely an by-product of having to do a lot of typing. Think about it, a typical coder will be very happy to write about 1000 lines of code in one day, yet, the average coder could probably type 1000 lines of non-sense code in about 5 minutes, if it takes 10 minutes, it doesn't matter much. It's mostly that if you see someone typing really fast, you know he's been at it for a long time. Thanks for the replies guys! I do have experience with PHP and MySQL, I forgot to add that but I'll update it. How can I enhance my knowledge in programming?